Comic Con is happening this weekend, and one year ago we were in San Diego to take part in the festivities. ‘Cats in Space,’ a short film starring my two kitty cats, Titan and Atlas, was screening as part of the Comic Con International Independent Film Festival. Here are some stills from the production. Aren’t they the cutest? Our wedding day is fast approaching, and there are still some elements that need to be completed. 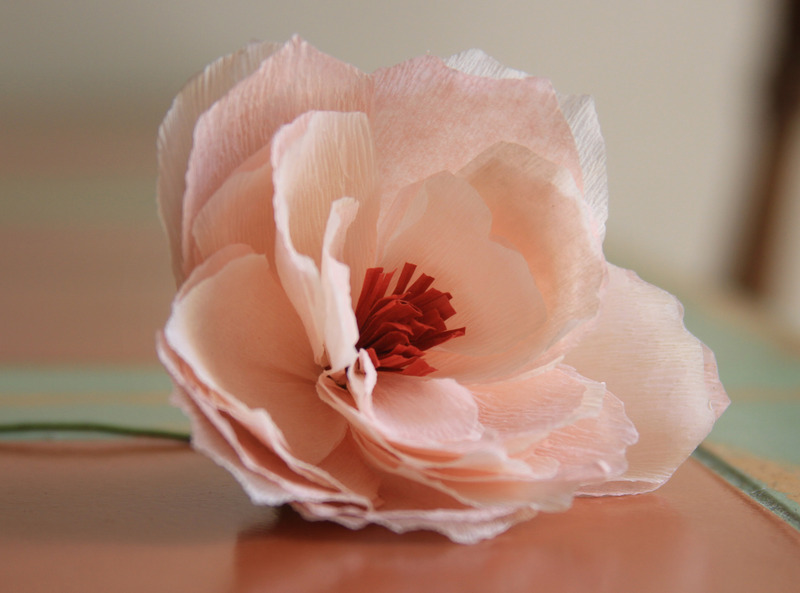 Over the past few weeks, we have been making paper flowers out of crepe paper as part of our centerpieces. 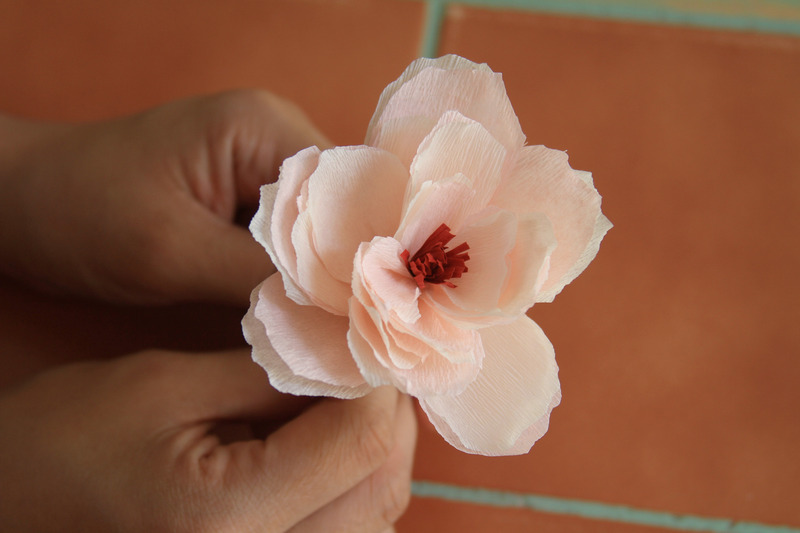 It’s a very tedious process, but this way we are able to design the flowers ourselves, pick the perfect colors, and save thousands of dollars by not using real ones. 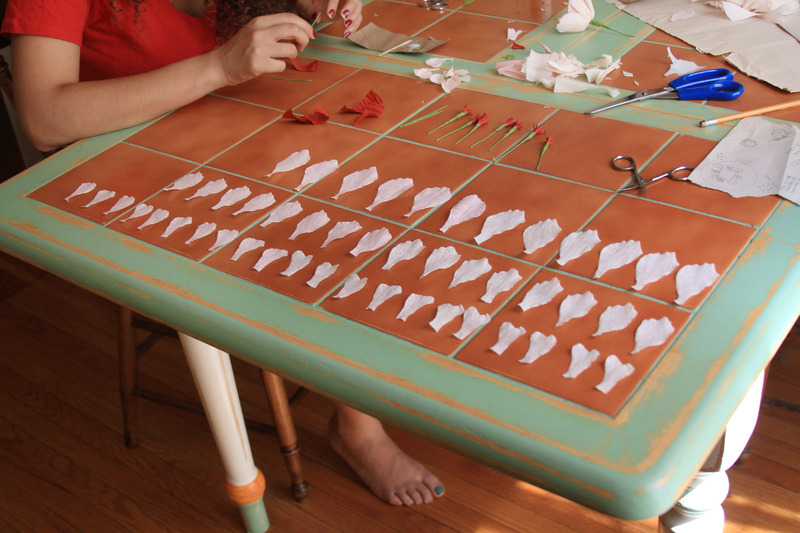 The first step is to cut out the shapes of the petals from crepe paper. 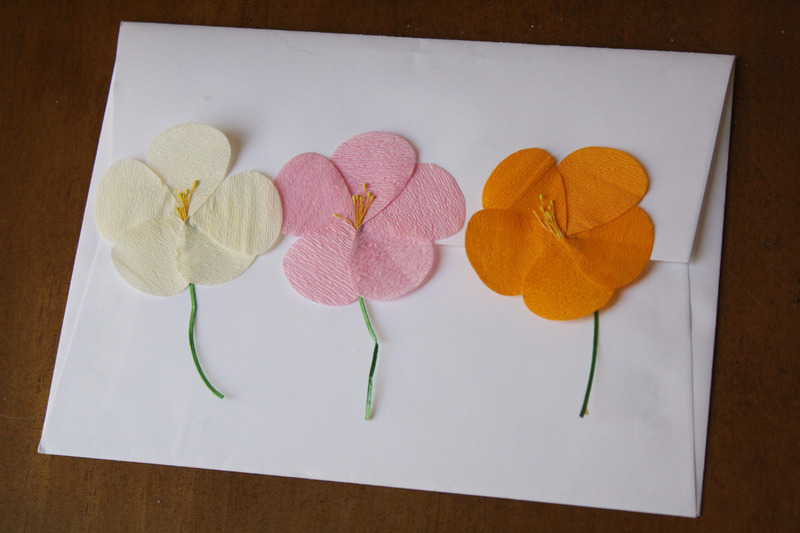 There are three different sizes of petals in each flower. 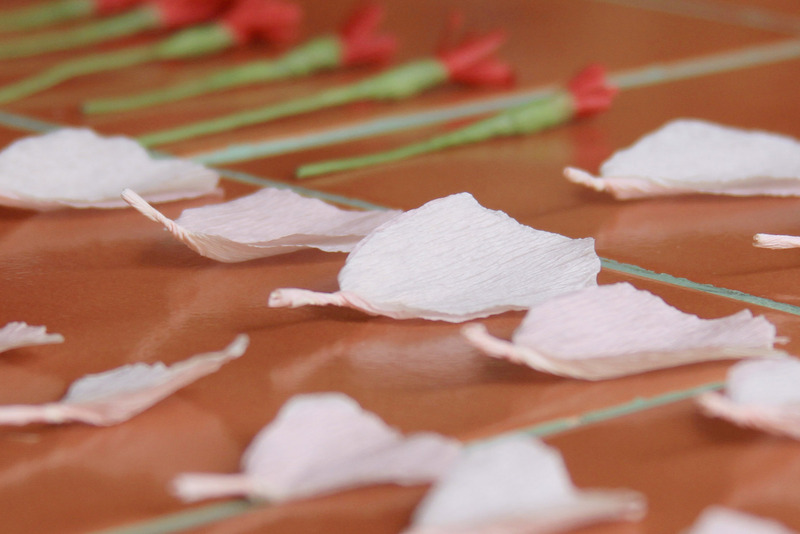 We chose a delicate pink and ivory for the petal colors, complimented with a red paper center. 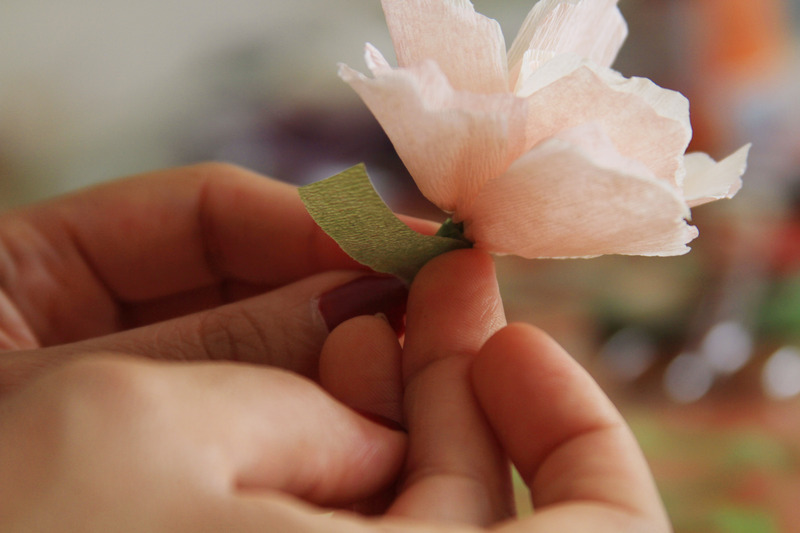 Each petal consists of a piece of of each color twisted together. We didn’t have any pips to put in the center, so we unrolled the handles of a paper bag and cut slits all across it. 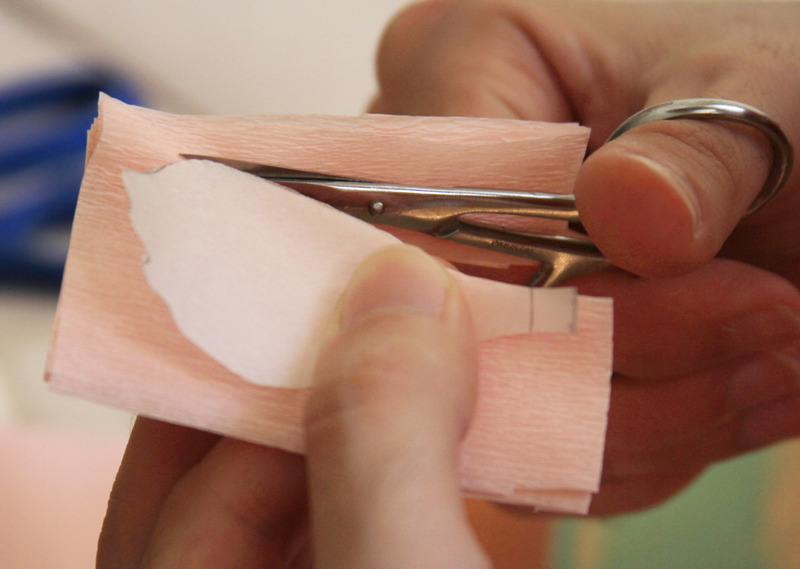 The most difficult part is attaching everything with floral tape. It doesn’t seem to stick well to anything except itself and my fingers. There are still quite a few to make, but we know that all the work will be worth it when they are placed around the lanterns on the centerpiece of each table. Over the past few years, we have worked on a number of film projects that required us to create our own props and costumes. 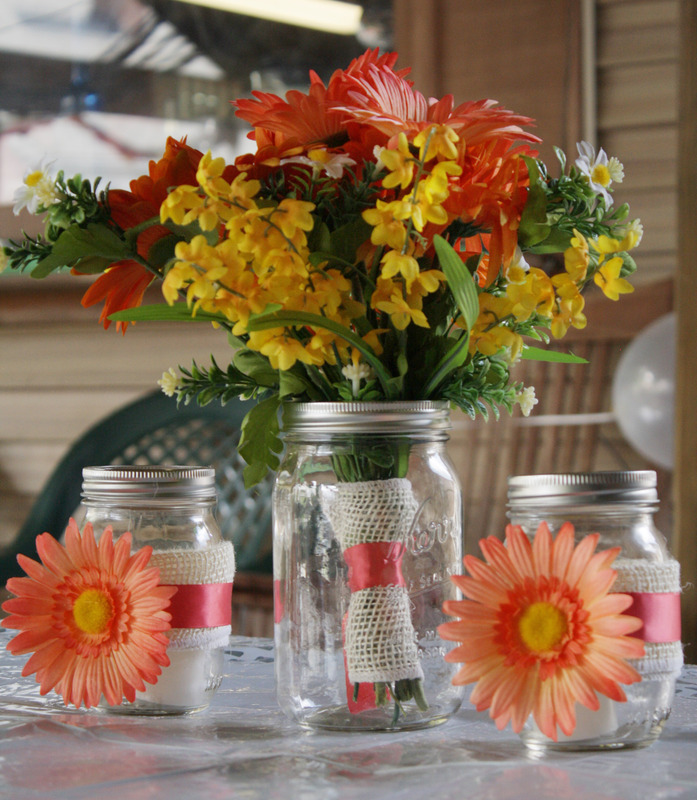 We’re always looking for cheap, fun ways to make them, and sometimes we keep them for display pieces around our home. Here are just a few examples of some work we have done so far. This Mayan statue of a quetzal was made entirely out of clay. It was a very easy clay to use that dried overnight without having to bake. We painted it with green spray paint, then applied black paint with a sponge, and covered that with clear coat. The back is never seen in the film, so it is unpainted cardboard. Here we purchased a skull prop and then melted a candle over it so that the wax would drip down. It was only seen in black and white, so we bought the cheapest candles, which happened to be orange. I made these prisoner costumes using black and white striped fabric, but because the white would have been too bright, we bought a dye that would soften it. Coincidentally, the cheapest option here was also orange, which worked out fine for the black and white project. There are a few simple elements going into this native costume, most of which were purchased at a party supplies store. James put together the spear by cutting out and painting a piece of cardboard and attaching it to a stick with feathers. These military medals and ribbons were made for a sci-fi project that never ended up happening. The metal parts were cut out of copper and soldered together. The ribbons were all sewn together from individual colors and hot glued to the metal. The bars were just photo paper printouts on top of name tags. Although these have never been put to use, we kept them in case they get used for a project in the future. Here is a map that James put together in Photoshop. We printed the map on plain paper, and then crumpled it up and singed with a lighter. This patriotic dancer costume was for another black and white scene (hence the purple ribbon). The main element here is the skirt, which I made by sewing strips of red and off-white fabric together. Unseen in this picture is a star that I put on the back of the cape. For the hat, we purchased all of the pieces separately, and then assembled using hot glue and thread. Here is another black and white costume that threw together a bunch of different colored elements. Rather than spending a lot of money on a leather aviator hat, I made a simple one out of cheap fabric. For this scene, we had to make a stack of antique books with specific titles. We bought used books for a dollar each, and aged them by filing and tearing. To screen print the ink, we tried to burn a screen ourselves, but we could not get it to work. We ended up going to a shop to use their screen printing table. James has repeatedly said that he deeply regrets using real antique books for this. Most of the books were recent releases, but there were a few that were about fifty years old or more. Rather than defacing antiques (which we had never done before and will never do again), we could have purchased journals that have covers that look like textured leather, which we have seen in numerous shops lately. Currently we are not working on any film projects, but we do have some lined up to happen after the wedding. We are already thinking of how we will execute the props and costumes for those films, and will continue posting more details about past and future projects here. Last weekend, James and I went to Rhode Island for the fourth of July. We had some wedding planning details to sort out, and also had a lot of fun spending time with my family, enjoying delicious seafood, and taking time to relax. One of the highlights of our trip was my bridal shower, which came out just as I imagined and hoped. My sister, who is my maid of honor, and my mother worked hard to make my shower a great success. Even before guests arrived, the tone was set with these beautiful invitations made by my sister. 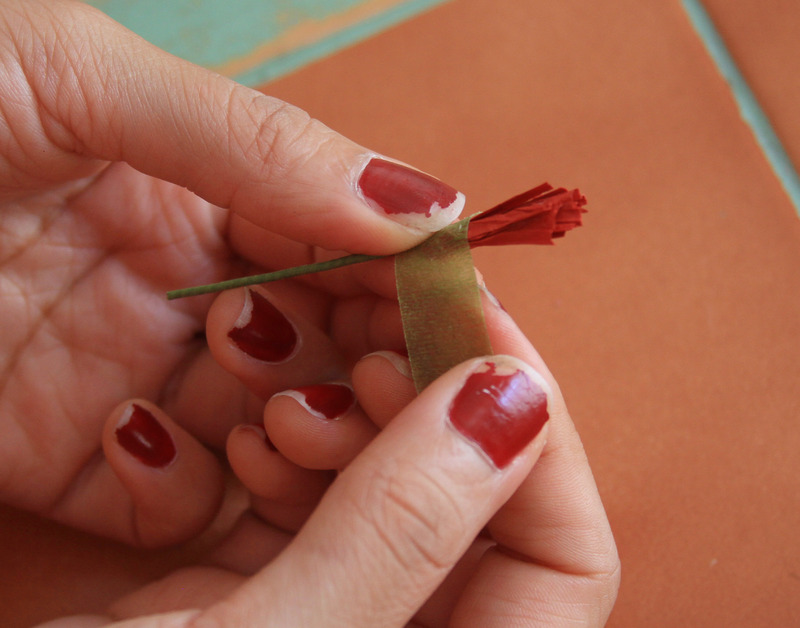 She used delicate flowers made out of crepe paper to line the outside flap, and another on the inside. I wore a white flowered lace dress with an open back, and painted my toe and fingernails coral and pink respectively to stick with the theme. 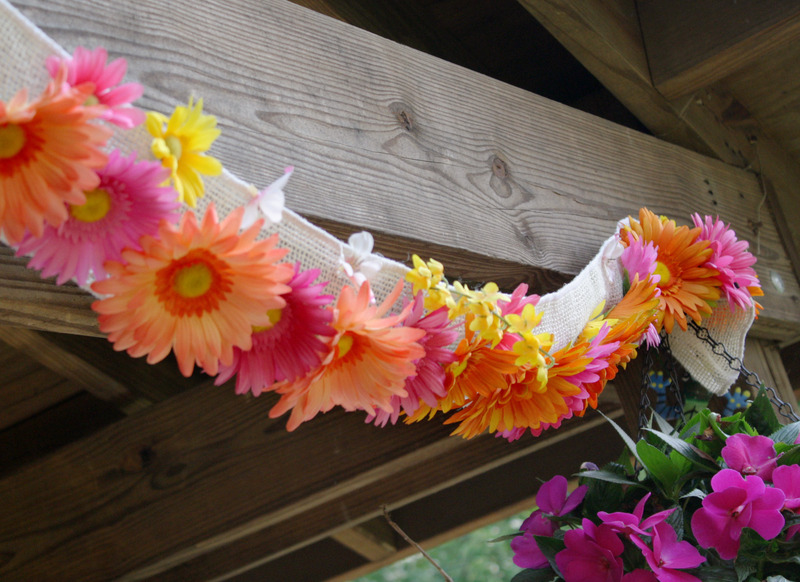 For the decor, my sisters created arrangements and banners using burlap, ribbon, and Gerbera daisies (they know they are my favorite flowers). Large jars held flower bouquets, while the smaller jars held little candles inside that were lit as it was getting darker. There were also tiny string lights placed around the garden that lit up as soon as the sun set, giving a lovely feel to the evening. 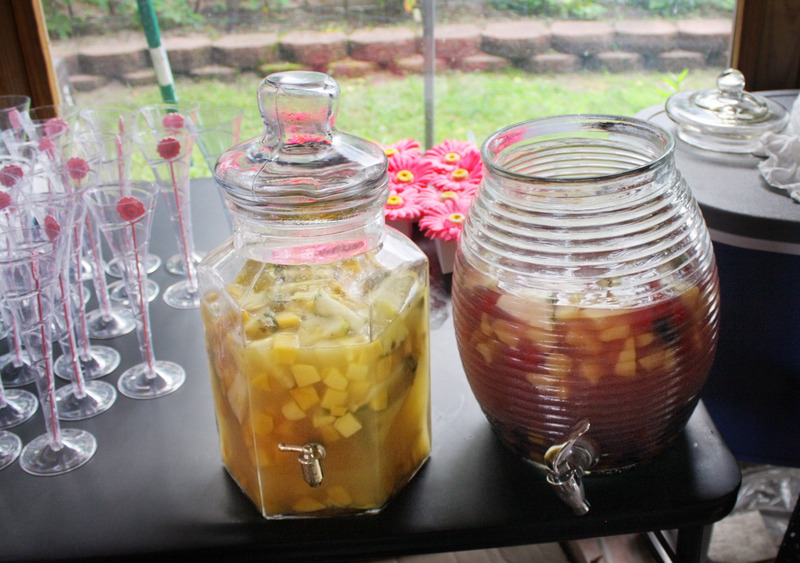 Two specialty cocktails were created, one using tropical fruits, pineapple juice, and rum. The other drink was an ode to sangria using champagne, gin and berries. 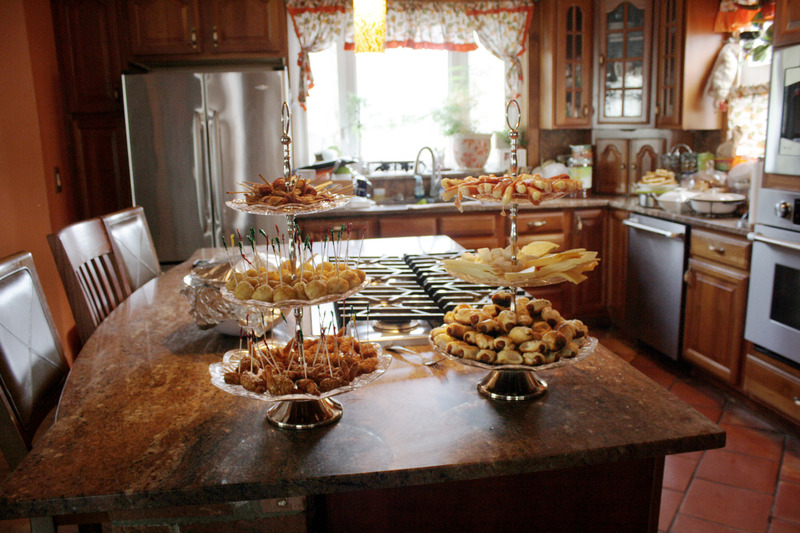 The food was primarily finger foods that could be easy to eat, and included many of my favorite things such as seafood, crab cakes, mini cheesesteaks, and bacon wrapped scallops to name a few. Everything was absolutely delicious. For dessert we had wine poached pears served with vanilla ice cream, and chocolate dipped strawberries made by one of my cousins. 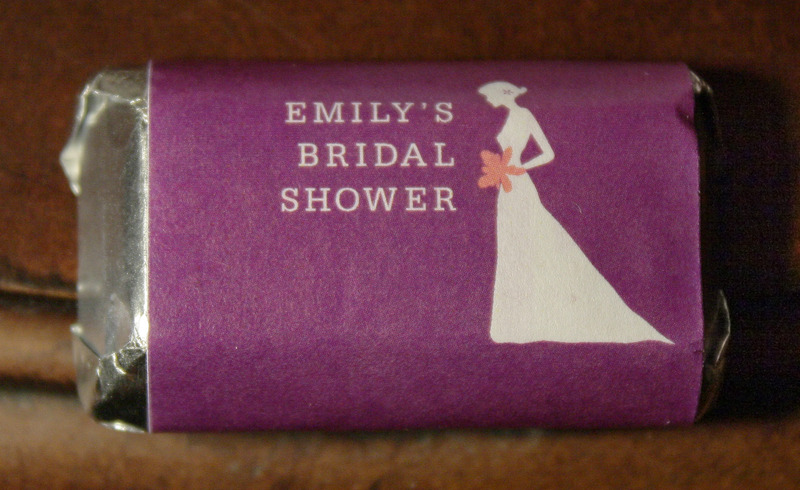 Favor boxes were made by attaching little daisies to boxes, and filled with personalized chocolates reading ‘Emily’s Bridal Shower.’ From the decorations, to food, and of course the company, I can say I had a fantastic time. I am so grateful to my sister who put this party together, and made it such a memorable night. My bridal shower made me realize just how close our wedding is, and I’m getting more nervous and excited by the day. Most fourth of July celebrations include a BBQ, summer drinks, and of course snacks. When I’m hosting I like to have a good variety of dishes that are easy to snack on, but when I’m only bringing one dish to a group gathering my go to is often spinach and artichoke dip. It’s a dip generally loved by all, and a quick and easy dish to make when pressed for time. I like to add a few extra ingredients from the traditional spinach and artichoke dip to give it more flavor. It has always been a crowd-pleaser to any event I have taken it to, and makes for easy cleaning when it gets completely eaten up. Pre-heat oven to 350F. Let the cream cheese sit at room temperature for a few minutes to get it softened. Mix cream cheese and sour cream in a pyrex/oven safe dish and mush together using a rubber spatula. Add the chopped spinach, basil leaves, artichokes and mix. Add mustard and parmesan cheese, then cream contents together until fully mixed. Bake for 15 – 20 minutes, or until dip has just started to bubble. Let cool and serve with tortilla chips or chopped vegetables.